Grandma Tum's Wild Curry restaurant off Thailand's Highway 346 draws in the crowds with its range of exotic meats like crocodile, deer and ostrich. But the eatery in Pathum Thani also attracts a different sort - poachers seeking to offload their haul of lizards, deer, wild boars and porcupines, freshly killed in the protected forests of Kanchanaburi just a two-hour drive away. "I refuse to buy from them because it's illegal," said owner Paungrat Janjaroen, 66, who opened the place in 2000 and serves only farmed game. Thailand's taste for unusual animals is nothing new, with chilli stir-fried turtles, squirrels and cobras just as likely to appear in a trendy city bar as in a rustic village shack, served up with a side of rice or french fries. Some of these are eaten for their medicinal properties - crocodile, for example, supposedly cures respiratory illness - while meats like venison are popular as a low-fat alternative to beef. This predilection however has taken a darker turn, after business tycoon Premchai Karnasuta and his entourage were arrested in February at a wildlife sanctuary. With them were the skinned and butchered remains of several wild animals, including a 1.5m-long black panther. According to police, the hunting party - which included Premchai's chef - were planning to cook and eat what they had shot, having stopped off earlier at a restaurant in Kanchanaburi to pick up supplies. Uproar soon ensued on social media condemning billionaire Premchai, 63, for the "murder" of protected animals "for his own pleasure". The Thung Yai Naresuan Wildlife Sanctuary where he was nabbed is a Unesco World Heritage Site, and part of Thailand's Western Forest Complex, the largest remaining forest track in mainland South-east Asia at 18,000 sq km . The carcass of a black leopard, which was found with billionaire Premchai Karnasuta's hunting party when police arrested them in a wildlife sanctuary. But this is not the first case of prominent Thais caught on hunting trips in the Thung Yai Naresuan sanctuary. In 1973, a large haul of butchered gaur - wild bison - and a cache of weapons were found in an army helicopter which had crashed in Nakhon Pathom province. Witnesses confirmed it was one of the helicopters used to ferry a group of 50 government officials to the sanctuary on a hunting trip, sparking a public outcry. "Hunting for game used to be considered a sign of manhood in Thailand's paternalistic society," said Mr Pipad Krajaejan, assistant professor of archaeology at Thammasat University. He explained that having hunted animals stuffed and mounted as decorations was also a sign of elitism among the rich. Poaching is also rampant because of a lack of manpower in enforcement. The Department of National Parks, Wildlife and Plant Conservation hires some 10,000 rangers to patrol 147 national parks and 16 wildlife sanctuaries across the country, but more resources are needed. "The rangers have other duties including taking care of visitors," said Mr Sasin Chalermlarp, secretary-general of the Seub Nakhasathien Foundation, a conservation group. "A bigger budget is needed to cover their welfare and overtime pay, so they can work more effectively in what can be a life-threatening job." Meanwhile, for local communities, living off the forest by poaching is a normal part of rural life. 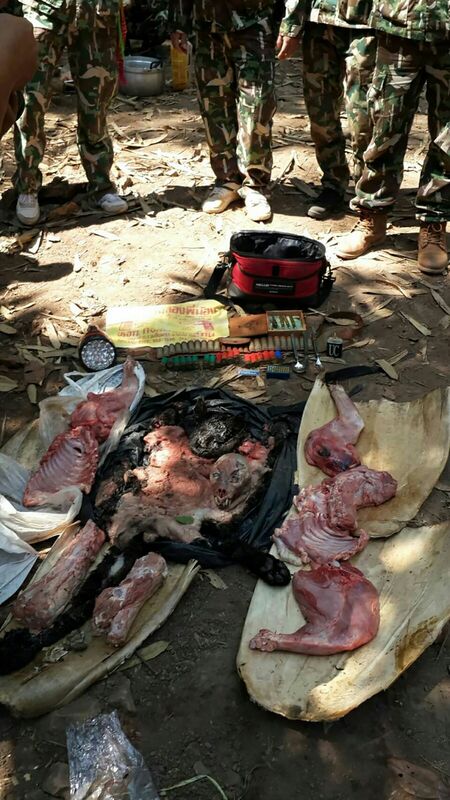 Two weeks after Premchai's arrest, a villager was caught within the forest reserve in Tak province, with 2kg of macaque meat meant for the cooking pot. In 2015, a group of poachers was arrested at Khao Ang Rue Nai Wildlife Sanctuary in Chachoengsao province lugging guns, animal traps and 40kg of venison that they said were ordered by locals for a party at 200 baht (S$8.40) per kg. They told police that demand for wild meat spikes during festivals. Despite the outrage over Premchai's hunting expedition, the Thai appetite for game shows no signs of abating. In Chonburi's Bang Lamung district, dozens of patrons - locals and tourists - sit at wooden tables placed on the dirt floor to savour the wild birds at the Uncle Rieng and Aunt Mali's open-air eatery. Chef and owner Wiwat Srikham, 46, chops the meat and the bones together before browning the mixture in a pan and adding chilli, basil leaves and fish sauce. He buys the birds from locals who catch them in the nearby forest, which is not a protected reserve. "The locals get the birds from around here. If they're small, I can get a pair of them at 50 baht, or if they're bigger, it is around 50 baht," said Mr Wiwat. He uses farmed venison and boar for other dishes. Meanwhile in the upmarket Rama IV Road district of Bangkok, fusion restaurant Wild & Co feeds the more discerning customer by recreating the great outdoors inside using stuffed animals and weather-beaten wood panelling, and dishing up venison tartare and ant eggs. Part-owner Pongpat Leelaratanakul told The Sunday Times that finding a stable supply of farmed quality game is a challenge. Wild & Co's head chef Alex Del Hoyo said he uses fresh venison tenderloins from a local supplier who charges almost 2,000 baht per kg. Seub Nakhasathien Foundation's Mr Sasin is not hopeful illegal hunting will end soon. He says poaching in Thailand has been going on for the past "hundred years" and will continue for "the next hundred, or as long as wild animals are free of charge and can be sold for money".